Allee Willis’ Kitsch O’ The Day – ‘Allee Willis’ Soup To Nuts Party Mix’ – LIVE SHOW!! In 1974, Allee Willis walked off stage in the middle of her own show. Now she’s finally coming back! The Grammy, Emmy, Tony and Webby award-winning and nominated songwriter, artist, singer, technologist, collector, and party thrower comes to the El Portal Theater in beautiful North Hollywood for one night only of songs, stories, and party games. Sing-along to Willis’ greatest hits like “September”, “Boogie Wonderland”, “Neutron Dance”, “What Have I Done To Deserve This” and “I’ll Be There For You (theme from Friends)”! Win valuable prizes! Watch her as she attempts to get through the evening without walking off stage for another 37 years! 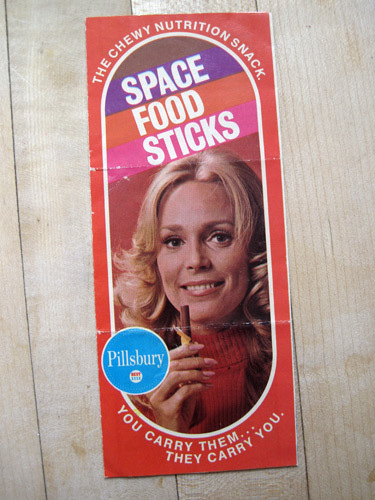 World’s first “Chewy nutrition snack – you carry them… they carry you!” Developed for astronauts, Space Food Sticks went to the moon so a year later when Pillsbury knocked out jerky looking logs of chocolate, peanut butter, carmel and chocolate malt, earthlings sucked them up by the bushel full. This is the pamphlet and a hefty 10 cents off coupon towards this pre-Jolt, Red Bull “sustain the energy lift” space stuff.